Silk/rayon blood chit, approximately 29 x 50cm. Printed in red, blue and black ink on rayon. For use by British aircrews flying missions over Asia. 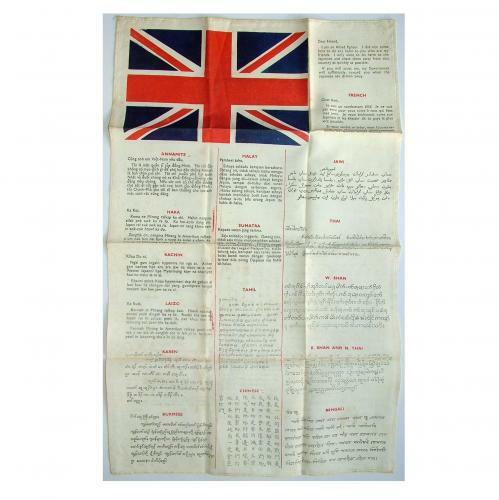 This is the second pattern 17 language chit printed with the Union flag in the upper left corner. The wording in 17 languages stating the owner to be an allied fighter only wanting to harm the Japanese. A little faded and with relatively faint spot marking. Has been folded/is creased but in good '+ used condition. Hemmed edges. Scarce. Stock code E20654.